At the U.S. Chamber of Commerce Foundation, we believe improving health isn't just for health care companies and it isn't just about employee wellness. It’s about people—and how to make their lives healthier, happier, and more productive. Businesses know that to have economic growth and prosperity in their communities and around the world, they need new and revolutionary strategies to empower healthy employees, customers, and communities. According to the Centers for Disease Control and Prevention (CDC), it is estimated that employers lose around $1,700 in productivity per employee, per year, due to health problems. Across the country, this scales to more than $225 billion in lost productivity per year. The impact of poor health doesn’t stop at the workplace. Over the past 16 years, the CDC has reported marked increases in many health factors that are based on behavior, culture, and community environment, including obesity, heart disease, and type 2 diabetes. These poor health outcomes are growing as the United States cements its status as the country that spends the most on health care. Health care spending doubled over the past 16 years, to around $8,500 per person in 2015. Yet, the U.S. is not seeing a great return on that massive investment, as it ranks in the middle of all nations for life expectancy; and consistently dropped since 1980 to be almost last among developed nations. The private sector has the talent, vision, and influence to help reverse challenging health trends and create a culture of health in America and around the globe. It can do so by its connection to its employees and to its consumers and local communities. Companies have increasingly embraced their role in the culture of health. We are delighted to release this case study report, highlighting the leadership of businesses working to improve health in their communities, across the country, and around the world. “Building a Business-led Culture of Health and Food Security” highlights a wide variety of work from the private sector that weaves together the issues of health, nutrition, and sustainable food systems. Stakeholders addressing poor health, obesity, and hunger have broadened their conversation to address all of the issues wrought by a food system that is not always accessible, available, or efficiently utilized. This case study helps contextualize that work in the wider focus of business-led initiatives and programming. As you will learn in this report, companies of all sizes from across a variety of sectors and industries are bringing forward-thinking approaches to a complex set of health challenges. They are embedding these solutions within their core business models, helping them strengthen communities, protect the planet, accelerate innovation and improve their bottom line. At the U.S. Chamber of Commerce Foundation, we provide an environment to learn, share, network, and collaborate to drive progress and achieve healthier, more sustainable people, planets, and businesses. We hope you find new ideas and innovative solutions for improving health in your organization and your community. In today’s competitive business environment, investing in well-being helps to attract and retain top talent by addressing the flexibility, wellness, and development opportunities that professionals value. Well-being is important in a high-performance culture—which is why Deloitte invests in a holistic approach that empowers its people to focus on their well-being and supports them throughout their life journey. We care about our people and we want them to be successful in their professional and personal lives. At Deloitte, our people are our greatest asset, and we believe that the well-being of our people is the well-being of Deloitte. We talked with our people to better understand their diverse well-being needs and learned that many want programs and resources to support them in work and in life. To better meet the demands of our evolving workforce, Deloitte developed and launched Empowered Well-being in 2015. This approach gives our people the support and flexibility to make daily choices that can enable them to be energized, confident, and aware. Empowered Well-being provides the opportunity for our people to personalize their experiences in the ways that matter most to them in body, mind, and purpose. Programs and benefits: We provide comprehensive and flexible benefits to eligible employees that support their diverse needs. Some of these benefits and programs include generous and flexible paid time off (PTO), sabbatical options, flexible work options, a subsidy that can help cover the cost of well-being-related purchases, and well-being days that allow our employees to collectively disconnect. More recently we released the Family Leave program, which offers 16 weeks of paid leave to both men and women to care for a new child joining the family through birth or adoption or to care for an ill family member. Education: We offer in-person science-based energy management courses, online micro-learnings, and well-being guides on such topics as nutrition, movement, positivity, impact of technology on well-being, mindfulness, stress management, and more. Well-being is seamlessly integrated into Deloitte University, where guests have access to a state-of-the-art fitness center, wellness professionals, and nutritious food. Well-being offerings and energy breaks are incorporated into program agendas, resulting in participants who are energized, refocused, refreshed, and poised for optimal productivity. Leadership and networks: To reinforce its commitment to well-being, Deloitte named a well-being leader to create and drive the strategy of Deloitte’s well-being approach. But Empowered Well-being also involves leadership at all levels, including our CEO, in setting the example by recognizing well-being behaviors, sharing their own challenges and success stories, and actively discussing well-being with their teams. We also developed a network of well-being ambassadors and inclusion councils at Deloitte to help share and encourage well-being behaviors and activities in their groups, teams, and offices. Data: Our Vitals dashboard provides data to identify people at risk of burnout well before they crash. This dashboard leverages data from existing systems to help leaders understand workload, travel, and whether professionals are using their PTO, so they can engage in ongoing well-being-related discussions with their individual team members. Well-being behaviors: Empowered Well-being is driven by the motto that small changes can have a big impact, so we encourage well-being behaviors throughout our workday. For instance, we incorporate energy breaks—such as stretches, meditation, and games—into daylong meetings to help get people reenergized. We provide well-being activity baskets for project teams to keep in their conference rooms so they always have access to fun and engaging energy break activities. We also offer virtual chair yoga sessions to provide professionals an easy way to incorporate movement, stretching, and mindfulness into their day. And our client teams reinforce flexibility and predictability in employee work schedules by encouraging such project-based initiatives as reduced business travel schedules, consistency in business travel scheduling, identification of core work hours, and setting norms around evening and weekend email. Each year, we conduct a talent survey to measure employee engagement around well-being, trust and integrity, future vision, and more. From fiscal year 2015 to 2016, our survey reported a double-digit jump in well-being, and our most recent survey continues to trend in the right direction. Employees indicated a higher rate of satisfaction with flexibility, predictability in schedules, stress level, and support, showing that continued investment and action has resulted in meaningful improvements across the organization. Additionally, our 2017 ranking for the Fortune 100 Best Companies to Work For jumped an astounding 26 points from last year. At Deloitte, we see well-being as a journey. Empowered well-being is a step in the right direction for us. Over the next years, we will be developing more well-being educational programs to help our people learn and implement well-being behaviors, and we will continue to look for ways to innovate our well-being-related offerings to meet the evolving needs of our people. Deloitte provides industry-leading audit, consulting, tax, and advisory services to many of the world’s most admired brands, including 80% of the Fortune 500. Our people work across more than 20 industry sectors to deliver measurable and lasting results that help reinforce public trust in our capital markets, inspire clients to make their most challenging business decisions with confidence, and help lead the way toward a stronger economy and a healthy society. For more information, visit Deloitte’s U.S. website at: http://www2.deloitte.com/us/en.html. As used in this document, “Deloitte” means one or more of Deloitte USA LLP, Deloitte LLP, and their respective subsidiaries. Please see www.deloitte.com/us/about for a detailed description of the legal structure of Deloitte USA LLP, Deloitte LLP, and their respective subsidiaries. Certain services may not be available to attest clients under the rules and regulations of public accounting. Workplace wellness can be a heavy lift for companies everywhere. In addition to the initial investment, companies must ensure employee participation and effectiveness to attain the desired outcomes. Yet 70% of healthcare costs in America are affected by the environments in which people live and work. So dropping these programs entirely isn’t a financially or socially viable option, either. That’s why the launch of the WELL Building Standard has seen tremendous success with companies and organizations across the globe. WELL is the leading tool for strategies designed to advance health and well-being in buildings globally. From active design elements that promote movement throughout the day, to circadian lighting systems designed to help energize people during the day and support their sleep at night, WELL comprises both policies and design features to redefine health in the workplace. At its core, WELL doesn’t require behavioral change—at least not at first. Through changes to employees’ circumstances, healthy decisions become easier and more appealing to choose while unhealthy decisions are inhibited. Just by going to work, employees find themselves in environments designed to help support their cardiovascular, respiratory, immune, and cognitive health. WELL Certified spaces are designed to support preventative medical intentions broadly and unobtrusively. For companies, investing in people and helping to improve their physical and mental health are basic economics. Approximately 90% of corporate expenses are tied to salary and benefits, which means the return on investment from healthier and happier employees can lead to cost savings. In addition to reduced absenteeism, productivity rates correlate with improved financial performance and health outcomes. That’s why employers have demonstrated interest in changing workplace environments and cultures to encourage healthier behaviors, and are starting to recognize the physical environment as an avenue to a healthy workplace culture. Consider the societal shift that could occur in the healthcare paradigm by harnessing office spaces as vehicles to encourage positive change in employee behavior. Through healthy building practices outlined by WELL, companies have a unique opportunity to implement designs intended to advance public health outcomes and employee engagement—redefining what a workplace wellness program can encompass. To learn more about WELL, visit wellcertified.com. Willis Towers Watson. “Employee Health and Business Success” (2016). Nestlé is committed to enhancing quality of life and contributing to a healthier future. As the world’s largest nutrition, health, and wellness company, and one of the leading providers of infant nutrition, we know the first 1,000 days—from pregnancy to a child’s second birthday—offer a unique window of opportunity to shape healthier and more prosperous futures. Parental leave practices in the U.S. are still well below global standards. Conditions around parental leave, ranging from back-to-work strategies to leadership culture to length of the paid parental leave, may have a negative impact on health, the economy, and women’s advancement in the workplace. In January 2016, Nestlé launched the Parent Support Policy (PSP). Available to all Nestlé employees who have been with the company for six months and work at least 30 hours per week, the PSP is gender-neutral and open to biological parents, adoptive parents, or any primary caregiver of a newborn child. Under the policy, primary caregivers are offered up to 14 weeks of paid leave and an additional 12 weeks of unpaid leave following the birth or adoption of a newborn child. Parents also can return to work on a part-time basis during the 26-week leave window. Nestlé also offers employees a broad network of parenthood support, including medical benefits and prescription drug benefits for infertility treatments, a free breast pump, 24-hour-a-day consultation with lactation specialists, children’s books, full-value coupons for Gerber formula or baby food, and a credit for other new parent essentials. When we announced the new policy, we committed to collecting internal analysis with the aim of understanding the policy’s impact on female employee retention. We’ve since expanded the scope of our analysis to understand the impact on wellness, health behaviors, and health costs. We anticipate that the data will support a strong business case for paid parental leave and will serve as an effective advocacy tool to encourage other companies to adopt similar policies. The policy took effect January 1, 2016, and the first employee began maternity leave under the PSP just six days later. One year after the policy’s launch, a total of 585 Nestlé employees had taken advantage of the program. Over the first year of the policy, the average participant took 13 weeks of leave, slightly less than the 14 weeks of paid leave offered through the PSP. These numbers support what American workers have long reported—that the inability to afford unpaid leave is the most common reason for foregoing needed time off. First-year data also hint at the importance of offering paid family leave to all employees—not just salaried or senior staff. A full 30% of PSP participants were hourly and commissioned workers. Hourly male employees were 40% more likely to take advantage of the PSP than men working in salaried positions. Nestlé is continuously working to make sure all employees understand and can take advantage of the policy. Finally, the first year of data provided encouraging evidence that a flexible workplace fosters a committed workforce. In 2016, 97.6% of Nestlé’s U.S. employees who used any form of parental leave were still active within Nestlé six months after their return. We are optimistic about retention impact and will continue to track retention levels. It makes you feel good to know that Nestlé is supporting you as a working parent,” Kelly says. Although quite a few companies have expanded their paid parental leave policies in recent years, parental leave practices in the U.S. are still well below global standards. Only 13% of workers have access to paid parental leave, and only 58% have access to unpaid leave. We encourage companies to provide paid parental leave. We are willing to provide counsel and lessons learned from our own experience. See nestleusa.com/parents for more information and how to contact us. MA, RD, CSR, Vice President of Clinical Support and Patient Alignment, DaVita Inc.
RDN, CDE, Manager, DaVita.com Nutrition, DaVita Inc.
Today’s fascination with food, cooking shows, and celebrity chefs speaks to the allure and importance of food in our daily lives. We equate food with nourishment, but it may also contribute to poor health—as seen in the rise of such chronic diseases as diabetes, heart disease, and high blood pressure. Food as medicine is part of the treatment plan for many of these diseases. People with chronic disease who require specialized diets face the challenges of applying dietary restrictions to improve and manage health while still enjoying food. These restrictions have an impact on daily food decisions, family meals, the ability to eat while away from home, and getting sufficient nourishment without exceeding prescribed food limitations. One in seven adults in the U.S. has chronic kidney disease (CKD). * DaVita Kidney Care provides dialysis treatment to over 190,000 people in the U.S., where nearly a half-million end-stage renal disease (ESRD) patients are undergoing dialysis. CKD and ESRD patients have unique challenges related to diet and nutrition management. They must eat in a way that focuses on components not typical with an ordinary diet. Balancing minerals including sodium, potassium, and phosphorus; eating the right amount of protein; and controlling fluids are central parts of a kidney diet. As a patient’s condition progresses through the five stages of CKD, these nutrient requirements change. To further complicate their situation, many patients have additional diseases that require diet modifications, and often the two conflict. These challenges can have a significant impact on a patient’s quality of life and meal enjoyment. DaVita recognized this dietary pain point for current dialysis patients and identified that the need for dietary assistance also existed in the CKD community. DaVita had the opportunity and ability to provide online resources to both audiences through its davita.com website. The team set out to create tools and resources for patients and their family members, caregivers, and healthcare team members who might provide these resources to patients without internet access. As the increased use of mobile devices has expanded access to the internet, DaVita has updated its website to a mobile-optimized platform so the content and tools can be accessed on all devices. The results of these efforts included online tools, recipe ideas, educational videos, dietian blogs and educational materials. In 2007, DaVita developed DaVita Diet Helper™, a free online tool created to help kidney patients with meal planning and nutrient tracking. Unlike most common diet trackers, this tool is based on protein and minerals that are specific to kidney patients’ needs and that aren’t generally included in other diet and nutrition offerings, nor are they available on food labels. Enhancements including a fluid tracker and dining-out guide have contributed to the value of this tool. DaVita leveraged its dedicated renal dietitian resources to develop the below suite of recipe, diet, and nutrition tools that can be used to help patients and caregivers manage complex diet and nutrition needs. The availability of online tools and resources over the past decade has brought recognition to DaVita as a primary and trusted source for kidney disease education. Many of DaVita’s dietitians nationwide use the website as a key resource for their dialysis patients. Other dietitians who specialize in kidney care, as well as community-based dietitians who care for patients with kidney disease, also can share these robust resources with their patients. DaVita has helped kidney patients better understand their diets and tackle food challenges. The positive impact on patient quality of life and clinical data, both observed and through patient testimonials, continues to drive DaVita’s dedicated focus to educate, engage, and empower kidney patients and their loved ones. *Adults ages 18 and older. Source: 2017 CDC National Center for Chronic Disease Prevention. In the U.S., malnutrition is commonly understood as a crisis in the developing world and it is associated with images of famished children in far-off lands. While starvation remains a terrible challenge for millions of people worldwide, micronutrient deficiency—or the lack of essential vitamins, minerals, and lipids—prohibits billions of people every day from reaching their full potential. This form of malnutrition or “hidden hunger” is recognized in the developing world but not yet as the serious public health issue it presents in the United States. Approximately 85% of Americans, of which more than half are children, do not consume the U.S. Food and Drug Administration’s recommended daily intake of the most important vitamins and minerals necessary for proper physical and mental development. Micronutrient deficiency early in life causes irreversible damage to cognitive and physical growth, leading to a diminished capacity to learn, poorer performance in school, greater susceptibility to infection and disease, and a lifetime of lost earning potential. This loss of potential affects the American workforce of tomorrow. To maximize the potential of our future, children must grow into healthy adults to be able to compete in the global economy. For many of the issues with which the U.S. struggle—from gaps in educational achievement to skyrocketing healthcare costs—societal costs are even greater. At DSM, we are passionate about ensuring every child’s right to develop to their fullest potential. We collaborate with Global Health Corps and the 1,000 Days organization to unlock full human potential by engaging experts in the fields of nutrition, healthcare, and advocacy to achieve equality in nutrition—the foundation for achieving improvements in all measures of societal health—both here in the U.S. and abroad. This partnership is born of a mutual call to action—to do something meaningful and effective—to improve the lives of our fellow global citizens. Global Health Corps is an organization dedicated to healthcare equality, a notion that did not exist before, and one that lends itself to action and investment in nutrition for children, which is the predominant aim of 1,000 Days. DSM lent its financial support to the 1,000 Days organization by funding two fellows from Global Health Corps to join the organization as it mobilized to investigate and address the state of malnutrition in the U.S. The fellows devised and developed campaigns on advocacy and awareness to drive greater action and investment in improving nutrition for women and young children. In September 2016, a coalition on Capitol Hill led by Barbara Bush of Global Health Corps, Lucy Sullivan of 1,000 Days, and Hugh Welsh of DSM shared a report titled “The First 1,000 Days: Nourishing America’s Future” and called on Congress to end nutritional deficiencies in maternal health and child development. Members of Congress, including Sen. Bob Casey and Rep. Rosa DeLauro, spoke passionately to an audience of healthcare professionals, social workers, community activists, and business leaders on the importance of raising awareness of hidden hunger and the impact it has on the communities they represent. A panel discussion followed that highlighted the perspectives of those at the forefront of the efforts. As a result, further forces were set in motion to enlist more champions and mobilize for more steps to be taken to reduce the prevalence of this complex and little-known health issue. Our next steps include educating and training healthcare professionals and childcare workers on the importance of nutrition. A lot of work still needs to be done in the context of a national conversation about health, as the issue of hidden hunger remains largely unknown. We will add our collective voices, energy, and skills to ensure that the conversation includes messaging and communications so that every American and global citizen has a right to an equal opportunity for optimal nutrition and the agency to determine how that can be achieved. This front-of-pack nutrition labeling initiative was launched in 2011 by the Grocery Manufacturers Association (GMA) and the Food Marketing Institute (FMI), which represent leading U.S. food, beverage, and consumer packaged goods manufacturers and grocery retailers. Facts Up Front makes key nutrition information more prominent and more accessible with a uniform label across brands, categories, and stores. It enables consumers to quickly compare products on the shelf and identify the foods that meet their personal nutrition needs. To support consumers, GMA and FMI launched a comprehensive consumer education campaign to drive consumer awareness, understanding, and use of Facts Up Front. The campaign included paid media, retailer tools, and a digital platform supported by such social media properties as Facebook and Twitter (@FactsUpFront). The $10.5 million campaign, conducted March-October 2014, reached approximately 90% of its target audience of moms. The Facts Up Front digital platform—FactsUpFront.org—was launched in 2013 and offers simple, interactive, and user-friendly tools—in both English and Spanish—to help consumers increase their nutrition knowledge, understand their individual nutrient needs, and use Facts Up Front when shopping. Paid media and other communications focused on this $1.2 million platform and the key information it provides to consumers. Retailers are equipped with an online toolkit to help them communicate about Facts Up Front and answer questions as consumers shopped. The kit includes such marketing assets as signage and display art to help drive awareness in stores. The 2014 campaign evaluation showed increases in awareness, understanding, and use among consumers, especially moms, who found Facts Up Front to be credible and useful. The results of this evaluation have been published in the peer-reviewed Journal of the Academy of Nutrition and Dietetics and the Journal of Consumer Affairs. A substantial and growing number of GMA and FMI members and nonmembers—118 as of July 2017—are using Facts Up Front on their products. The most significant hurdle encountered over the past several years has been adopting several other federal labeling initiatives, such as revisions to the Nutrition Facts Panel and the calorie declaration requirements for products in the vending channel. What we eat matters and has the greatest impact on our overall health, and dietary patterns that are higher in vegetables, fruits, whole grains, and lean protein such as fish are linked with lower risk of chronic diseases. We all know that eating healthy is important, but it’s hard to adopt at the personal level if our environment doesn’t support our healthy choices. Seafood Nutrition Partnership (SNP) is proud to be a part of the nutrition solution. At the heart of our public health crisis is the food Americans currently consume. The costly chronic disease epidemic that results in part from unhealthy diets and poor nutrition will be most sustainably addressed through behavior change. Behavior change is difficult at the individual level, and we know it will take a communitywide effort to support healthy lifestyles. SNP is providing an important piece of the solution to America’s public health crisis by building a roadmap for local communities to inspire their citizens to modify their food choices to include sustainable and healthy seafood. Simply, SNP’s mission sits at the nexus of human, environmental, and community health. Nearly 70% of deaths in the U.S. are preventable through diet and lifestyle changes. Our nation spends roughly 86% of our healthcare dollars on treating preventable diseases, which translates annually to $315 billion for cardiovascular disease, $245 billion for diabetes, and $147 billion for obesity-related medical costs. Currently only one in 10 Americans eat seafood at least twice per week per the Dietary Guidelines and, on average, Americans are taking in just 80 mg of omega-3s EPA+DHA per day, despite recommendations by prominent health organizations to take in at least 250-500 mg of omega-3s EPA+DHA per day. The main call to action for SNP’s Public Health Education Campaign is the Healthy Heart Pledge, which is to try to eat seafood at least twice per week per USDA Dietary Guidelines. • To date, 37,000+ people have taken the pledge. • In the past year, 1 in 3 Americans intentionally added more seafood to their diets to eat healthier. • For those that took the Healthy Heart Pledge: almost 60% eat seafood twice per week and over 35% take omega-3 EPA+DHA supplements regularly. • National and local partnerships with influential leaders in business, healthcare, foundations, foodservice, retail, academia, and non-profits. Why Eat More Seafood and Omega-3s? A diet rich in seafood, such as fish and shellfish, can help prevent many of the fatal diseases that affect Americans. The benefits of a seafood-rich diet are scientifically proven. Studies show eating just 8 oz. of seafood a week reduces the risks of dying from heart disease by about a third. Older adults who have the highest blood levels of the fatty acids found in fish are likely to live longer than those with lower levels. Mothers to be who eat 8 to 12 oz. of seafood each week tend to have children with better outcomes for brain and eye health and are observed to have higher IQ scores. Omega-3s from marine sources have anti-inflammatory properties and are the major building blocks for the cells in the brain, eyes, and heart. As the leading 501(c)3 nonprofit organization in the U.S. that builds awareness of the health and nutritional benefits of seafood, SNP launched a three-year public health education campaign to help address the country’s public health crisis through public-private partnerships and education outreach programs that inspire Americans to incorporate more seafood and omega-3s into their diets for improved health as per United States Department of Agriculture/Health and Human Services (USDA/HHS) Dietary Guidelines. We are pleased to report that our campaign is working. SNP built its public health campaign model after other successful models, such as seat belt safety and smoking cessation, and the central program is grassroots outreach conducted in target cities and communities at an elevated risk for chronic disease. The keys to success have been the coalition of local leaders who have come together to help their communities get healthier through nutrition intervention and a simple call to action. Local leaders include elected officials and leaders in the business, healthcare, faith, culinary, academic, and retail sectors who support the campaign, execute interactive events, and educate members of their communities about the health benefits of seafood and how to include it more frequently in daily meals. SNP cities include Birmingham, Alabama; Brunswick, Georgia; Charleston, West Virginia; Indianapolis, Indiana; Jacksonville, Florida; Memphis, Tennessee; and Oklahoma City, Oklahoma. Our main call to action is for people to take the Healthy Heart Pledge, which is to try to eat seafood twice a week and supplement with omega-3s EPA+DHA as needed. SNP provides support to pledgemakers with monthly eNewsletters, recipes, and coupons. Since the launch of our public health education campaign, we have secured more than 37,000 Healthy Heart Pledges nationwide. The Department of Commerce–National Oceanic Atmospheric Administration Fisheries Division reported that Americans added almost 1 pound of seafood per person to their diet in 2015. And our 2017 national survey showed that one in three Americans added seafood to their diet in 2016. We are grateful to partner with local leaders in our target market cities to determine the best outreach strategies needed to get communities to include more seafood and omega-3s in their diets. Our work would not be possible without the support of our key stakeholders: our board, scientific and nutrition advisory council, ambassadors, donors, and partners, all of whom are all making a difference in every aspect of our mission. We look forward to continuing our work as we plan for phase 2 of our public health education campaign. We invite you to join us in this innovative campaign and to learn more at www.seafoodnutrition.org. We know smoking is bad news. It is the leading cause of lung cancer - the number one cancer killer of both men and women. Smoking also increases the risks of stroke, heart disease, and other types of cancers almost anywhere in the body. And there is even worse news: Second-hand smoke can be just as bad, especially for children, who are at higher risk for asthma attacks, respiratory infections, and ear infections. Smoking-related illnesses cost the U.S. more than $300 billion each year - much of this straining the health care services that we, one of the nation’s largest health care companies, are trying to provide affordably for our customers. The Healthy Generations strategic platform guides us in identifying community partners that share our goals and commitment to creating a healthier generation of Americans. We also realize that poor health can’t be addressed in a silo. Our greatest successes have resulted from exceptional partnerships, proven program models and opportunities to improve health across multiple Healthy Generations focus areas. One such success involves our partnership with the American Lung Association and some promising “good” news concerning the issue of smoking. Quitting smoking is not easy but smoking is the NUMBER ONE MOST PREVENTABLE cause of death and disease in the U.S. and individuals that engage with a proven effective, evidence-based cessation program are most successful in adopting a tobacco-free, healthier lifestyle. Through our long-standing partnership with the American Lung Association, we have identified and implemented powerful smoking cessation models that have reduced tobacco disparities for specific priority populations including pregnant women, veterans, and individuals with behavioral health needs. Most specifically, results from the Freedom from Smoking model have been impressive with more than double the individuals quitting smoking than anticipated. In 2016, the US Department of Housing and Urban Development (HUD) announced a nationwide smoking ban in public housing that went into effect in 2017. Public housing residents include vulnerable and diverse populations, with 38% of them being children; 45% are African American; 25% are Latino; and 95% are in low to extremely low income groups. HUD has urged local public housing authorities (PHAs) to enforce the ban and provide solutions for residents who smoke within the next 18 months, yet has not provided additional resources for them to do so. The need for help is great. Offering online and telephonic cessation services 24 hours a day. With the ban affecting more than 1.5 million residents across 687,125 public housing units in 26 Anthem market areas, we were excited to step up for those who need the most help quitting and giving up the life-threatening habit for good. Our hopes are high for success as we have had more than four in ten individuals managing to quit smoking within this model in earlier campaigns. This program exemplifies Anthem Foundation’s goals for improving community health by creating a powerful public/private partnership model, addressing four out of five of our Healthy Generations focus areas, building upon our past success with our national nonprofit partner and reaching low socioeconomic populations that are at the greatest risk. Even more importantly, there was no question which initiative we were most excited to highlight in this report as we work together to reduce or eliminate exposure to secondhand smoke for our most vulnerable neighbors - the children of the coming generation. GSK—one of the world’s leading research-based pharmaceutical and healthcare companies—is committed to improving the quality of human life by enabling people to do more, feel better, and live longer. As a part of GSK’s long-standing commitment to building healthy communities, in 2012 we facilitated several town halls, a national survey, and an advisory council to uncover insights about what it takes to build healthier communities in the U.S. Along the way, we learned that up to 80% of what influences the length and quality of an individual’s life happens outside the doctor’s office and that behavioral, social, economic, and environmental factors—which often differ significantly from community to community—have an even greater impact than clinical care. We realized that if we were going to make a meaningful impact in the communities where we live and work, our community partnerships needed to go beyond healthcare services. That’s why we created the GSK IMPACT Grant initiative to support networks of nonprofit organizations working together in a collective impact framework to help underserved young people live healthier lives and contribute to a healthier community. Our first GSK IMPACT Grant was launched in 2014. It supported the Youth-Directed Healthy Recreation Centers collective led by LiveWell Colorado, to increase healthy eating and active living for teens and their families through community-driven improvements to recreation centers in Northeast Denver. To get more families into the centers, the collective worked with young leaders to survey their peers and identify improvements that resulted in an incredible 200% increase in attendance. From the Denver pilot, we learned that not only are young people the best conduit to positively influence peer behavior, but they are also effective messengers to adults who are making decisions on their behalf. We decided that all future GSK IMPACT Grant proposals would include a youth leadership strategy based on our belief that engaging young people is not only the right thing to do, it is the best way to improve health outcomes in the communities where we live and work. · Eighty percent of what influences an individual’s health outcomes are community factors outside the healthcare system. · Young people can affect the behavior of their peers and inform decisions made by adults. · It is important to intentionally engage young people in the design and implementation of a community health program. Since then, we have launched three more GSK IMPACT Grants—in Philadelphia, Pennsylvania (Get HYPE Philly!, led by The Food Trust); East St. Louis, Illinois (East Side Thrives, part of East Side Aligned); and Raleigh-Durham, North Carolina (Fostering Wellness, led by Community Partnerships Inc.). Each collective is improving health outcomes for youth in line with local needs by empowering young people to develop their own approaches to building a healthier community. Next to launch in 2015 was Get HYPE Philly!, and at the heart of its mission to build a healthier Philadelphia are the 1,442 youth leaders who have been trained through this initiative so far. The youth leaders report that they are choosing healthier foods and have increased confidence in their abilities and leadership skills. To date, nearly 20,000 youths across the city have participated in healthy programming as a result of Get HYPE Philly’s leadership, including 347 activities designed by the youth leaders themselves. One notable achievement of our Get HYPE Philly! youth leaders is their work to increase water access in city schools. They heard from peers about broken water fountains and how this lack of access to clean water was keeping students from staying hydrated throughout the school day, so they did their own research on the importance of hydration—for example, according to the Centers for Disease Control, providing access to drinking water can increase overall water consumption versus sugary beverages. Taking their case to decision makers, youth leaders spoke with Philadelphia’s City Council and School Reform Commission. Because of the youth leaders’ efforts, the city council passed legislation that requires one water fountain per 100 students in schools across the city and the school district made a public commitment to install three hydration stations in every public school over the next year, giving over 130,000 students access to safe, appealing drinking water. We have learned that engaging youth is a great way to improve their health outcomes, but we still need to learn from one another about the most effective ways to do so. This spring, representatives from all of our current GSK IMPACT Grant communities led a panel discussion at the 2017 Collective Impact Convening about involving young people in collective impact efforts. The panelists shared many lessons, including how adults must intentionally engage young people in the design and implementation of any community health program, the importance of building authentic relationships and meeting young people where they are, and giving young people the space and tools to identify health barriers that might not be apparent to the adults they are working with. We hope to continue this discussion with other funders and community groups to develop more ways to build the next generation of leaders to make our communities healthier places to live, work, learn, and thrive. 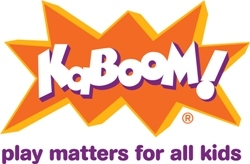 In an effort to provide easily accessible play for all kids across the U.S., KaBOOM! launched the national Play Everywhere Challenge. Designed to spark creativity in the way cities plan for kids and families, the challenge received over 1,000 applications from people all across the country with ideas on how to incorporate play into everyday spaces—at bus stops, in laundromats and grocery stores, on sidewalks, and more. KaBOOM!, in collaboration with the Robert Wood Johnson Foundation, Target, Playworld, the Department of Housing and Urban Development, and National Education Association, awarded 50 winners with $1 million to create their play installations and encourage kids to play “along the way,” and make time for outdoor physical activity throughout their daily routines. These projects were installed from late 2016 to mid-2017. Despite a collective understanding that play is essential to healthy development, kids are not getting adequate playtime each day. In 2014, KaBOOM! partnered with ideas42, a behavioral research firm, to understand the barriers that prevent kids from playing and how communities could overcome these barriers. KaBOOM! and ideas42 found that there is not a natural point in the day when parents or caregivers are faced with the choice of whether to play, unlike making healthy choices about eating, for example. Play is also not as easy and accessible as it could be: making play the easy choice requires integration into the daily lives and routines of kids and families. This is particularly important when thinking about equitable communities. Low-income kids spend 25% more time doing chores and running errands with parents than their affluent peers. Playgrounds provide great oases of play for kids in urban communities, and play must be easily accessible at many points throughout the day, especially in such unexpected places as laundromats, grocery stores, bus stops, and sidewalks—places where kids are already spending time, most often waiting or in other unengaging activities. Thus, the challenge was also able to turn moments of frustration into moments of joy. KaBOOM!, in conjunction with the five collaborators, launched the Play Everywhere Challenge (PEC) to address the need for play in cities by seeding ideas and helping to spread them across the nation. The PEC is an effort to help solve the issue of play accessibility within cities and ensure kids have easy opportunities to play each day, in everyday locations like bus stops and sidewalks. The effort was a challenge format, where people submitted ideas and competed to win implementation grants, to encourage rapid development of the best, most creative ideas. The PEC was launched in 2016, and most projects were installed in 2017. The challenge recognized 200 finalists and awarded grants totaling $1 million to 50 winners across the United States. The challenge served as an operational enabler by giving cities and communities urban planning tools and resources that result in better outcomes for how a city is formed or reformed. The Lexington Downtown Development Authority is part of an ambitious public-private partnership called the Town Branch Commons, which seeks to revitalize parts of downtown Lexington, Kentucky, with a trail system. The goals of the project were to improve the public transit experience; provide opportunities for safe, imaginative play; encourage conversation and interaction among kids and caregivers; and serve as a demonstration project to show the value of kid-friendly design. As KaBOOM! continues to spread the word about play everywhere and future play everywhere grant opportunities, the hope is that additional cities and communities implement their own ways to play. These first 50 projects serve as inspiration for new and future ideas for kids everywhere. Communities for Health is a healthier workforce initiative launched in 2015 by Sodexo and the YMCA of Central Florida that seeks to significantly impact the health of communities by working with organizations to systematically approach their employees’ health through a population health perspective. The theory behind Communities for Health is that leveraging an organization’s wellness dollars for an employee plus one (family or friend) can not only show improvements in workforce health and reductions in healthcare spending, but also change the course of health within the employee’s family and community. The central focus of this initiative is to engage employees and their families into evidence based programs for chronic disease prevention and intervention. First, Communities for Health utilizes an approach that stratifies individuals for appropriate intervention based on their current health. Then, the program focuses more specifically on providing opportunities for participants to achieve sustainable change by offering a “plus one model” that allows employees to invite a colleague, family member, or friend to join them. This structure offers employees genuine support on their health journey and ultimately takes the organization’s wellness dollars’ impact deep into the community, providing access to programs and services not readily available to others. Simply put, the overarching goal of our initiative is to design a workplace wellness program that improves employee health while yielding a clear return on investment for employers that can then be leveraged to improve the health of the communities in which they live and work. At Sodexo, our commitment to corporate responsibility is evidenced by our Better Tomorrow 2025 Plan, which includes nine commitments that are fully aligned with the UN’s Sustainable Development Goals. Two of the nine commitments are focused on improving the quality of life of our 425,000 employees and 75 million consumers we serve daily around the globe. The Communities for Health initiative is a great example of Sodexo’s commitment and capability to make a measurable impact on the health and well-being of our people, consumers, and communities. We approached the YMCA Association of Central Florida (and Y-USA) to embark with us on this journey to improve community health because we believed that if we could effectively harness the power of our two global organizations we could make a larger impact on community health. Our unique public-private partnership allowed us to leverage best practices and expertise from our respective private and public sectors to address a major public health crisis—the rising prevalence of obesity and diabetes—in a serious and meaningful way. Early in the partnership’s existence, the Kresge Foundation supported this belief in the partnership’s potential impact by offering additional support to the YMCA in this effort. Participation in Communities for Health begins at the workplace with trained wellness champions encouraging their peers to enroll into the program via a user-friendly program website. An employee opts-in to receive tailored health communications, starting with an invitation to schedule a biometric screening test to better understand their personal health status. Based on the results, participants are immediately connected to a lifestyle coach who recommends an appropriate program and serves as their coach throughout the duration of the program. Sodexo’s registered dietitian-led programs called Core4 Lifestyle Management and Core4 for Diabetics, and the YMCA’s diabetes prevention program were offered to eligible participants. Once an employee’s personal health plans are in place, a series of personalized communications are provided to support individual health and well-being goals and long term behavior change. As part of the program support, participants are encouraged to invite a “buddy” to join them on their health journey and access fitness, healthy eating and wellness classes at their local YMCA. 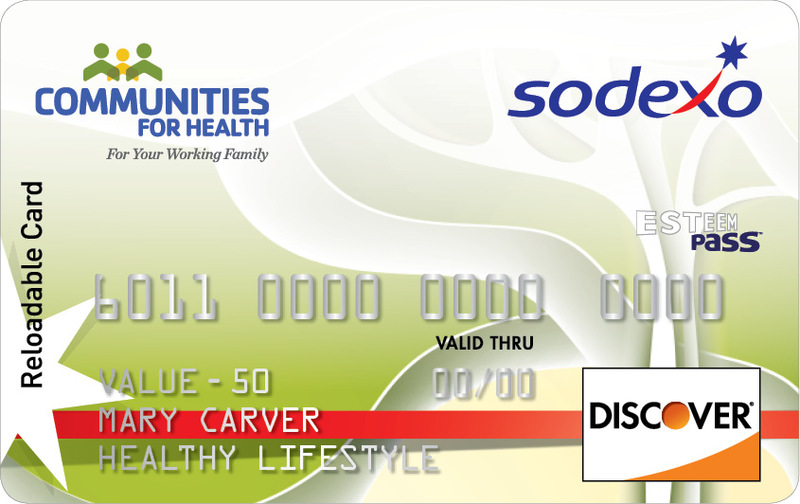 In addition, employees receive reward cards which can be used at thousands of healthy restaurants and retailers as part of the incentive program designed by Sodexo Benefits and Rewards Services. Over the past two years, we have seen positive results from the initiative. 1) We eclipsed national average participation rates of employees identified for inclusion in fitness (21%), weight/obesity (10%), and disease management programs (16%) by achieving rates of 88%, 63% and 73% respectively. 2) A higher percentage of employees were stratified in the lower risk group in Year 2 when compared to Year 1 (+5%). Similarly, this shift toward improved health was also seen in a reduction in those in the higher risk group for Year 2 (-2% for moderate risk; -5% for high risk). This suggests that employees became healthier over time. 3) In addition to the “physical/physiological” data points that were analyzed, quality of life indicators were utilized to assess the impact of interventions and initiatives as well. We saw improvements in the overall perception of individuals feeling “fit”, “happy with their weight”, “less stressed”, “less trouble sleeping”, and “more energetic” when compared between Year 1 and Year 2. Read a powerful Q&A session with Nebeyou Abebe, Senior Director for Health & Well-being at Sodexo and Greg Rowland, Associate Buyer Inventory Acquisition at Orlando Utilities Commission. Our experiences have provided many valuable lessons learned that continue to help shape new employee and community health and well-being innovations. We are excited to continue and expand the Communities for Health programming. For more information, please contact Nebeyou Abebe at nebeyou.abebe@sodexo.com. Sodexo is the global leader in services that improve Quality of Life, an essential factor in individual and organizational performance. Operating in 80 countries, Sodexo serves 75 million consumers each day through its unique combination of On-site Services, Benefits and Rewards Services and Personal and Home Services. Through its more than 100 services, Sodexo provides clients an integrated offering developed over 50 years of experience: from food services, reception, safety, maintenance and cleaning, to facilities and equipment management; from Meal Pass, Gift Pass and Mobility Pass benefits for employees to in-home assistance, child care centers and concierge services. Sodexo’s success and performance are founded on its independence, its sustainable business and financial model and its ability to continuously develop and to engage the commitment of its 425,000 employees throughout the world. Everyone knows that daily fruits and vegetables are essential to good health. But not everyone can afford them: 30 million Americans live in “food deserts” and twice that number struggle with food insecurity. Families in poverty often must rely on the most affordable choices, which means produce is often off the table—literally—leading to what has been called the hunger-obesity paradox. Diet has surpassed smoking as the leading cause of disease and death in America, as diabetes, hypertension, and high cholesterol reach epidemic rates while disproportionately afflicting communities in poverty. And the resulting healthcare costs are staggering. Nationally, we spend $1.4 trillion annually in the treatment of these diseases and in lost productivity. But at Wholesome Wave, the national nonprofit I founded, we see a solution: making produce affordable. Because when people can afford fruits and vegetables, they buy them. Diets change overnight and, over time, public health improves. That’s why we’ve been working since 2007 to make produce affordable for the people who need it most. In 2016, we reached over 500,000 Americans, but we’re particularly proud to have teamed up with Target, America’s sixth-largest national retailer, to change the lives of hundreds of families in Los Angeles. Wholesome Wave has been perfecting produce prescription programs since 2008, and this was our largest yet. Launched in June 2016 through an $800,000 grant from Target and a partnership with the Eisner Pediatric & Family Medical Center, our LA Produce Prescription (FVRx) Program provided 544 low-income patients with prescriptions their families could redeem for free produce at Target stores and area farmers markets. A federally qualified health center, Eisner’s clientele fit Wholesome Wave’s target population: families that can’t afford fruits and vegetables. More than 98% of the clinic’s patients are below 150% of the poverty level. Patient families that qualify for FVRx earned less than $39,248 for a household of five. Prior to enrollment, most patients weren’t eating even half the recommended amount of fruits and vegetables, and 65% of participating households were food insecure. Eisner’s pediatricians say urging parents to feed their children more produce can be futile—if they can’t afford it, their kids can’t eat it. Her eyes lit up when she raved about our program, saying that, thanks to the program, she and her son were able to eat lots of cucumbers; strawberries; jicama; lettuce; tomatoes; corn; carrots; and her new favorite, Brussels sprouts. All of which meant extra income for area agriculture. At a nearby weekly market, farmers took in an additional $70,000 through this program in just a few months. They made more money by selling more produce to the customers who need it most. Target went beyond the role of funder, also serving as a location for patients to redeem their fruit and vegetable prescriptions, resulting in 10-hours-per-day, seven-days-per-week access to healthy food for enrolled patients. In just six months we reached over 500 pediatric patients and their families, who spent over $270,000 on fruits and vegetables (over $140,000 of it at Target), with nearly 60% of parents reporting improvements in their children’s health over the six months of the program. Ninety three percent of patients reported meeting fruit and vegetable guidelines at the close of the program, and of those who didn’t meet vegetable intake guidelines at the beginning of the program, there was a 206% increase in vegetable servings by the end. Participating patients also reported a 38% decrease in food insecurity. And low-income families weren’t the only ones to benefit. For Target, this closed-loop program also drove brand loyalty, positive social responsibility, customer acquisition, and new revenue streams. For every $1 produce prescription redeemed at Target, customers spent an additional $1 of their own money on fruits and vegetables—a true win-win for both the customer and Target. But don’t take her word for it—or mine. The program’s successful outcomes earned it a place on Fast Company’s list of 2017 World-Changing Ideas, and the U.S. Chamber of Commerce Foundation’s Health Means Business Partnership of the Year award. And while we’re proud of these impacts, they’re just the beginning. Here at Wholesome Wave, we’re positioned to take this work to tens of millions of Americans, and to truly change the world—through food. For more information and to contact us, visit wholesomewave.org. According to the Centers for Disease Control and Prevention (CDC), 86% of the nation’s $2.7 trillion annual healthcare expenditures are for people with chronic conditions. Our nation’s healthcare system must focus on preventing disease if it is to remain economically competitive. Healthcare delivery systems need to reduce hospitalizations and unnecessary procedures, and community prevention partnerships are one way to accomplish this. The Robert Wood Johnson Foundation and the YMCA (the Y) of the USA have formed a 10-year partnership to look at models to better integrate the community into the healthcare delivery system. This work is driven by the human and economic urgency to prevent and control chronic disease and our understanding that 80% of health outcomes are driven by factors outside clinical care—such as health behaviors, social and economic circumstances, and the physical environment in which people live. Community-based organizations like the Y can navigate community environments and implement practical and evidence-based health solutions with the private sector, saving lives and healthcare dollars. For more than a decade, the Y has led efforts to scale evidence-based programs (EBPs) that have been shown to reduce the risk for or complication of chronic diseases. The YMCA’s Diabetes Prevention Program (DPP) proved it was possible to drastically reduce the incidence of type 2 diabetes among those 86 million Americans living with prediabetes and save employers and health insurance providers billions of dollars. A Y pilot with the Centers for Medicare and Medicaid Services showed the Y could save the government $2,650 per senior over 15 months by making the program available to Medicare beneficiaries. Medicare plans to cover the program nationally beginning April 2018. The Y’s ability to deliver and scale the Diabetes Prevention Program was the result of a 21-year effort that began with research at the National Institutes of Health, the CDC, and academic institutions that showed a 58% reduction in new cases of type 2 diabetes. Although the clinical intervention was costly, Indiana University’s School of Medicine partnered with the Y to replicate the results in a Y setting for a fraction of the cost. An innovative community, business, and government partnership between the CDC, UnitedHealth Group (UHG), and the Y was the impetus for translating and scaling the DPP to the community. The CDC instituted a recognition program for community-based providers of the DPP, like the YMCA, to ensure fidelity to the program and its outcomes. UHG, through a subsidiary (Optum), would help any employer or insurer support individuals and families by incentivizing participation in the program, encouraging and accepting referrals from healthcare providers, and then providing reimbursements on a performance basis. Optum served as a third-party administrator for the YMCA of the USA, assisting with referrals, reimbursements, data collection, marketing, and contracting with health insurers and employers. Most community-based organizations have never previously provided these functions in their day-to-day operations. Lessons learned through the work with Optum have enabled the Y to take on responsibilities to advance third-party reimbursement for the DPP and other EBPs delivered by Ys, working with athenahealth for cloud-based electronic medical record and claim submission services. The YMCA’s Diabetes Prevention Program is already working with national insurers and hundreds of employers (including public sector employers) who pay for the program. Many state and county employer plans are now paying for the program. The Y offers several other EBPs, including interventions for cancer survivors, adults living with arthritis and hypertension, and children living with obesity. These programs all have clinical trial data and some have measured return on investments and should be attractive to payers and insurers alike to improve health and reduce costs. Medical societies, health professionals, and third-party payers are working to help increase referrals to EBPs at the community level. The American Medical Association believes that physicians can help reduce the burden of diabetes and hypertension by educating patients about local resources and programs, so it is encouraging physicians to screen patients for prediabetes and refer eligible patients to participate in the DPP. It’s important to explore models that close the gap between the community and the health system to elevate prevention and control of chronic disease, to help consumers navigate the health system, and to curb the exponential growth in healthcare costs to employers. Dr. John Nkengasong, director of the Africa Centres for Disease Control, was born here. He was an only child, and his mother was emphatic that he have access to better healthcare than what was available in the village. When he reached the age of 7, she insisted that he leave Fotabong to live with his aunt. Through his years of development as a medical professional, his mother continued to remind him to give back to his native Fotabong by supporting improved healthcare. When his mother died, Dr. Nkengasong returned to his birthplace with his wife and dedicated himself to securing better healthcare for the local population to honor his mother’s memory. “The people of Fotabong were desperate and hopeless, but then BD [Becton, Dickinson and Company] and Heart to Heart stepped in and brought hope and a promise of good health,” Dr. Nkengasong said. “That is why we are calling this project Hope for Health.” Hope for Health is a partnership between the community, the government, the social sector, and the private sector. For its design and implementation, Dr. Nkengasong works closely with the Cameroon Ministry of Health; Heart to Heart International (HHI), a nongovernmental organization; and BD, a leading global medical technology company with a commitment to advancing the world of health. The hospital in Fotabong has two main buildings: the old facility where it currently functions and a newer building constructed by the government of Cameroon to serve as a maternity unit. The new unit, however, has never been functional as it remains incomplete, unequipped, and now in need of repairs. Like its physical infrastructure, the hospital’s management had similarly fallen into disrepair. In 2011, the government of Cameroon assigned a medical officer to oversee the hospital. Because the officer had several other facilities under his supervision, the resulting oversight was limited. Over time, the quality of medical care in Fotabong deteriorated, leading to a lack of confidence in the hospital and a loss of access to basic healthcare for local and regional residents. Then, in 2015, a team of BD associates visited Fotabong to assess the hospital’s needs. Committed to restoring hope for better medical care, the team returned the following year with representatives from HHI. 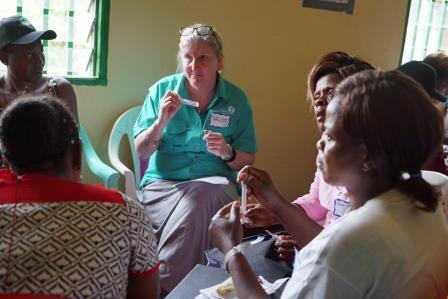 Together they met with community leaders, teachers, and government officials to develop an understanding of the local context and priorities. The result of their visit was Hope for Health, a three-year project designed to improve access to healthcare by addressing critical needs and strengthening key aspects of the Fotabong district hospital. While the project’s management and resources come from BD and HHI, its design complies with the rules and regulations outlined by the Ministry of Health and its implementation is closely coordinated with hospital administrators. As part of its commitment, BD donated products and services and arranged to send volunteers to assist HHI. In February 2017, the BD Volunteer Service Trip (VST) Program sent 12 BD associates to Fotabong for a three-week engagement. The volunteers took an active role in training community healthcare workers, improving laboratory quality, overseeing the installation of a new roof for the hospital, upgrading plumbing and electrical infrastructure, and working with hospital administrators to plan for financial sustainability. The VST cohort also included a communications team to capture and report on progress. training 22 community healthcare workers, three nurses, and two laboratorians. hiring, In advance of the 2017 volunteer program, a new physician for Fotabong hospital, which has helped steadily increase patient volume. A BD Volunteer Service Trip team plans to return in spring 2018 to continue the effort to support healthcare improvements for Fotabong and the surrounding communities. It is clear that Dr. Nkengasong’s determination and influence was the catalyst for Hope for Health. For the countless medical facilities across the globe in need of support, partnerships such as this serve to inspire hope for new collaborative arrangements that can rally resources to address urgent needs. IBM is committed to a world where everyone can live a healthy life. In the 1950s, we provided machines that expedited polio vaccination research; in the 1960s and 1970s, we developed early hospital information and patient tracking systems. In 2015, IBM launched Watson Health, which leverages cognitive computing to solve complex health and medical challenges worldwide. Over 7,000 health-focused employees create and deliver solutions using the latest technologies and computing power. IBM’s corporate citizenship programs support nonprofits to improve health outcomes in our communities by integrating our leading solutions and talent. In particular, through a portfolio of programs we offer analytics software, consulting and cloud based technologies to our nonprofit partners around the world. Oncology: Watson cognitive software is helping researchers at the Netherlands-based Semmy Foundation better understand how to extend the life expectancy for children with brainstem tumors. IBM technology is improving MRI scanning and image analysis to more quickly deliver the information needed to diagnose this cancer. In Peru, a Corporate Service Corps team worked with Cervicusco to help the organization scale cervical cancer screenings from 35,000 women to 75,000. Populations in Crisis: IBM helped Médecins Sans Frontières/Doctors Without Borders (MSF) in Italy to collect, manage, and analyze refugee and migrant data, resulting in a mobile app that allows MSF to capture real-time medical data using mobile tablets, regardless of connectivity. Watson Analytics, part of the solution, has enabled cognitive analysis and predictive capabilities that equip practitioners to understand and act on their data in a faster, more insightful way. Infectious Diseases: IBM delivered a self-adaptive, cognitive-based solution that provides modeling for epidemic disease prediction and analysis of case numbers and trends to the Center for Disease Control in Shenzhen, China, to help prevent and control infectious disease outbreaks. In Brazil, IBM leveraged social media analytics to help Fiocruz deepen its understanding of the spread of Zika virus. Our World Community Grid has advanced health research with the Scripps Research Institute to search for Ebola antiviral drugs and treatments for HIV. Mental Health: IBM is helping Mental Health America (MHA) uncover insights from standard data collected from online mental health questionnaires. The results of this work will help MHA understand trends to better tailor services and response needs. The Malaysian Mental Health Association received consulting to help the organization leverage social media to tackle mental health issues and improve influencer engagement. Community Health: Sometimes more sophisticated data management solutions transcend health areas to support nonprofits with greater efficiencies. New York-based Hudson Guild uses IBM SafetyNet to document the impact services have on the health of their its local community through access to nutritious food and important benefits, such as Medicaid and Medicare, and to educate clients about living a healthy lifestyle. IBM volunteers are building mobile solutions to help the elderly, manage refugee camps, and address many other medical needs globally. IBM’s innovative cognitive computing technology has helped usher in a new era in technology, where IT systems are no longer programmed—they understand and continuously learn. This power opens new frontiers, furthering a history of innovations made possible by pioneering methods and tools for data analysis. IBM envisions a world where all people live healthy lives, as health is both an end and a means to further development and well-being. We remain committed to leveraging our capabilities to achieving this future. Globally, more than 800 women die in pregnancy and childbirth daily, and most of these cases would have been prevented if the women had access to affordable, quality care and modern contraception. Through Merck for Mothers, Merck’s 10-year, $500 million initiative that applies scientific and business expertise—as well as its financial resources and experience in taking on tough global healthcare challenges—we’re focused on reducing preventable maternal deaths worldwide. Merck for Mothers is known as MSD for Mothers outside the United States and Canada. One of the most cost-effective ways to reduce maternal deaths is to ensure access to modern contraception. A potential one-third of deaths can be averted by lowering the overall number of pregnancies and helping girls and women to space out and plan their pregnancies. In Senegal, strides have been made in reducing maternal mortality since 1990, but there is still a 1 in 61 chance a woman will die in pregnancy or childbirth. In 2011, public health facilities sampled in two districts in the Dakar region of Senegal exhibited situations where contraceptives were out of stock over 80% of the year. Through interviews, 84% of women reported experiencing stock-outs of their preferred contraceptive method in the previous year. At that time, only 29% of women who wanted to delay or prevent pregnancy were using modern contraceptives. To tackle the problem of low contraception use in Senegal, Merck for Mothers partnered with the Bill & Melinda Gates Foundation, IntraHealth International, and Senegal’s Ministry of Health and Social Action to introduce an innovative supply chain model to reduce stock-outs at health facilities, broaden contraception options, and, ultimately, empower girls and women. The Informed Push Model borrows practices from the commercial sector to improve availability of healthcare commodities in public health facilities. 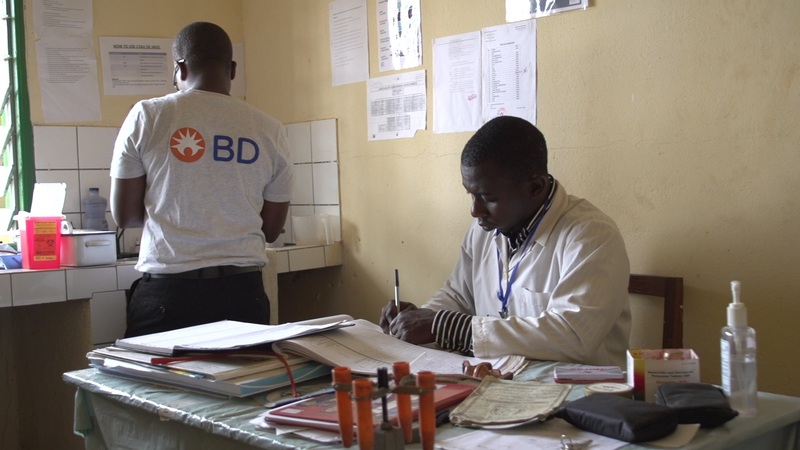 Today, third-party logistics providers (3PLs) deliver commodities directly to all 1,400 public health facilities in Senegal, using real-time data to make on-the-spot stocking decisions. The 3PLs use tablets to record health facility inventory, measure recent consumption, and calculate the amount of stock to leave at the facility for future demand, providing unprecedented visibility of contraception use and needs to help inform programmatic and procurement decisions. · Government: Instead of filling orders, government employees can manage the end-to-end supply chain and analyze supply chain data to improve health outcomes. · Businesses: By providing opportunities for 3PLs to serve public health facilities, the model has the added bonus of creating jobs and business growth, diversifying the local economy. The private suppliers are incentivized to stock—and maintain—adequate supplies of an array of contraceptives, with oversight provided by the government. · Health Facilities: When health facilities have reliable, independent provision of health commodities, they can focus on providing services to patients. It also encourages the facilities to carry a wider range of contraception choices. · Consumers: When given a reliable and broader selection, women are more likely to find the contraception method that meets their needs and be confident in its availability. · Society: When women survive, the community and nation thrive. Conversely, when a woman dies, her baby is 10 times more likely to die by age 2, and her other children are 10 times more likely to leave school, suffer poor health, or die prematurely. Over three years, total contraceptive stock-outs have been reduced to less than 2% nationwide across more than 1,400 facilities in all regions, improving contraception access and options for more than 3.2 million women and girls. The catalyzing action of the Informed Push Model has become a valuable example of private sector engagement in public sector supply chain reform, and a case study of how applying inventive approaches and partnering across sectors—from private to nonprofit and government—can ensure sustainable solutions. Data from the Senegal program is being evaluated so lessons learned and best practices can be shared with other countries seeking to transform their supply chains. To continue the fight against maternal deaths in Senegal, the informed push model is transitioning to be completely government run—operationally and financially—by the end of 2017. And the impact inspired by this model is expanding much further: Senegal’s government has committed to integrating the private sector into the public health supply chain, beyond contraceptives, to ensure access to other essential commodities for illnesses like AIDS, tuberculosis, and malaria and conditions like post-partum hemorrhage—in all, a total of 118 essential commodities. General Mills and our brands have many efforts underway worldwide to increase biodiversity and improve pollinator health. We also partner with the USDA and the Xerces Society, the international nonprofit organization that protects wildlife through the conservation of invertebrates and their habitats. It’s hard not to be intrigued by bees, especially since they are responsible for so many of our favorite foods – like fruits, nuts, honey and even vegetables. Bees and other native pollinators are instrumental in agriculture – 35 percent of crop production worldwide depends on pollinators. Keeping bees healthy is a priority for General Mills which is why we fund pollinator research to better understand why bees are in decline, invest to conserve and expand bee habitats, and work with our suppliers to improve the health and effectiveness of bees. On a small farm in Morra, a village in northwest India, farming is hard. Breaking the soil in this arid land means exactly that. Tilling creates large, jagged chunks of earth that more closely resemble rocks than anything that could support crops. Finding water is harder. For generations, farmers have dug wells to capture the rain that falls during the year, if it comes at all. Roughly hewn wells must penetrate at least 60 feet of the unyielding stone that’s indigenous to the region. Farmers dig deeper every year in hope of harnessing precious, life-sustaining water. All of this work—and more—is done by hand, day in, and day out. Yet, in this inhospitable environment, a farmer named Sita thrives through her innovation. She does not have a tractor or modern precision agriculture technology—she moves herself, her family, and her village forward using the agricultural expertise provided to her by JIVA. JIVA is the Joint Initiative for Village Advancement, a multi-year program created by the John Deere Foundation and PYXERA Global to improve the lives of the nearly 6,000 people living in three adjacent villages in rural India—Morra, Madara, and Sakrawas. JIVA traces its roots to a volunteer project led by John Deere CEO Sam Allen in 2011, when a team of the company’s employees worked for a week side-by-side with Sita and other farmers to learn firsthand the challenges they face. Inspired by this experience, the John Deere Foundation reached out to PYXERA Global, a non-profit organization with a quarter century of experience enhancing the abilities of people and communities worldwide to solve complex problems. Together, they worked in the three villages to identify the most pressing needs and to help the communities determine for themselves how to best meet those challenges. Improving their primary livelihood—farming—was their unanimous priority. The program’s name, JIVA, honors this primary concern. “Jiva” means “life” and “livelihood” in Mewari, the language spoken in the three villages. With the guidance of JIVA’s agricultural experts, Sita began growing vegetables as part of a “nutrition garden.” Her garden has become so successful that it not only produces enough to feed her family, but also grows extra quantities that Sita sells to support the needs of her village and beyond. The garden has transformed the lives of Sita and her family. Sita lives in a part of India where the average person earns only 60 rupees, or 1 dollar, a day. Average annual income is close to 22,000 rupees, or $365, per year. Because of the success of Sita’s nutrition garden, her annual income has increased by almost 45,000 rupees, or $750, a year. While Sita is certainly a role model she is not alone. Today, JIVA supports 200 women growing produce in nutrition gardens and small farms. For farmers like Sita, there are no easy paths, no silver bullets, and no magic potions that will ensure success. Instead, to be successful, farmers must be prepared to anticipate and appropriately adjust their efforts based on a daunting array of ever-changing environmental and market conditions. With the reality of farming in mind, JIVA established its founding principle the “freedom to innovate.” With the freedom to innovate, JIVA empowers its staff and farmers in the villages to explore new agricultural practices—a daunting task in a place where farmers have been using the same techniques for generations. JIVA participates with farmers in pioneering new agricultural practices, and applies the lessons learned over the last several years to responsibly, responsively, and cost-effectively scale the most effective agricultural interventions. In addition to changing the lives of individual farmers like Sita, the freedom to innovate is transforming agriculture in the villages on a large scale. Before JIVA, local farmers did not believe they could grow high-value crops like pomegranates. However, upon seeing for themselves pomegranate’s income-generating potential and resiliency through exposure visits and intensive training, farmers began to believe they could make it work. Today, local farmers have planted over 13,000 pomegranate trees in these three villages alone, which once mature stand to increase overall agricultural income in the villages by as much as 6 million rupees, or $100,000, annually. With these results as proof, the John Deere Foundation and PYXERA Global see the freedom to innovate as more than the key to JIVA’s success – it is the key to improving the lives of the world’s farmers. At Feeding America (FA) and Target, we envision a hunger-free America. FA, through a network of 200 local member food banks, feeds more children, families, and seniors than any other domestic hunger relief organization—4 billion meals in 2016 alone. Target is a long-standing partner of FA, and in 2016 donated more than 51 million meals through store donations to food banks across the country. Even as the FA network distributes more meals each year, research estimates that 8.7 billion more meals would be needed in a given year to feed every person facing hunger in America. In addition, people struggling with hunger are often at higher risk for nutrition-related illnesses. According to Hunger in America 2014, 58% of the households FA serves have at least one member with high blood pressure and 33% have at least one member with diabetes. FA’s task is not only to provide meals for people in need, but also to provide nutritious meals that can help improve the health and well-being of people we help. Fresh produce provides a tremendous opportunity to both feed people facing hunger and offer nutrient-rich foods that can improve health outcomes. We know that an enormous amount of produce is wasted in the United States each year. In fact, 20 billion pounds of fruits and vegetables are discarded on farms or left in fields to be ploughed under before the following season, and that does not include produce lost at manufacturing and retail locations. FA, with the support and partnership of Target,* has developed an innovative solution that will simultaneously decrease food waste and increase the amount of produce available to communities. Our vision is to create a coordinated model that optimizes the fresh produce opportunity across the nation for network food banks, regardless of location or capacity. To do that, we are creating seven regional produce cooperatives (RPCs) strategically located across the country that will centralize produce sourcing and distribution: Lower Midwest (Indiana), Upper Midwest (Minnesota), Southeast (Georgia), Mid-Atlantic (Pennsylvania), Northwest (Washington), Southwest (Texas), and West (California). The RPCs will enable the delivery of a greater variety of produce to partner food banks at a lower cost and with more consistency. In the past, each of FA’s 200 food banks identified the produce to be sourced and arranged for pickup and transport from growers to the food bank. Developing and implementing the RPCs creates an efficient and effective model to procure and process larger volumes while continuing to make it possible for food banks of all sizes to receive the products needed for their local communities. Each RPC is member-led and operates one central processing facility to receive, store, and distribute large amounts of produce. By aggregating demand and centralizing the ordering and processing, each site can leverage the collective size of all food banks in its region to negotiate better prices for services, including transportation and lower the acquisition cost. Furthermore, the cooperatives are able to accept more produce donations, thereby eliminating food waste throughout the supply chain. Currently, some food banks may not be able to accept large loads of produce because they will not be able to use it fast enough with their agency partners. This creates the potential for a load of oranges or a pallet of potatoes to become food waste instead of a healthy snack or dinner. Full loads of produce will be arriving at the RPCs, where each food bank can order a mix of different types of produce as well as smaller amounts to fit its unique needs. Each RPC is at a different point in its formation, but FA has seen incredible success already. Since the Southwest location launched in summer 2016, 14 million pounds of produce have shipped through the facility to the 21 food banks serving Texas. The other RPCs, which are in earlier phases of operation, have shipped 4.5 million pounds since May 2017. The RPCs are improving food banks’ efficiency and planning by helping to build the network’s capability to aggregate demand, expand the variety of produce available, and improve distribution of this healthy but highly perishable food. Most important, they are increasing the amount of produce available to families and communities served by the FA network. *Cargill also is a funder of the Regional Produce Cooperatives. CocoaAction brings the world’s leading cocoa and chocolate companies together to accelerate sustainability and improve the livelihoods of 300,000 cocoa farmers in Côte d’Ivoire and Ghana. In 2013, the World Cocoa Foundation (WCF) brought together cocoa supply chain heavyweights, including suppliers and manufacturers, to create CocoaAction as a platform through which the companies could align individual sustainability strategies and objectives in mutually beneficial ways, and with the objective of also benefiting others in the cocoa sector, especially cocoa farmers and their communities. Companies currently committed to CocoaAction include Barry Callebaut; Blommer; Cargill; Ferrero; The Hershey Company; Mars, Incorporated; Mondelēz International; Nestlé; and Olam. WCF acts as the strategy’s convener, facilitating implementation, driving alignment, and generating new insights to amplify its impact. CocoaAction coordinates the sector on regional priority issues, enables scale through common interventions and an agreed results framework, shares best practices and failures through a collective learning culture, and works closely with governments and key stakeholders. CocoaAction’s vision is a sustainable and thriving cocoa sector—where farmers prosper, cocoa-growing communities are empowered, human rights are respected, and the environment is conserved. CocoaAction companies recognize that the sustainability challenges of the cocoa sector require urgent action and a radically different approach. CocoaAction was created with one fundamental principle at its heart: that members can achieve even more collectively, while still retaining the freedom to act individually. At the outset, CocoaAction companies’ senior-most executives met frequently to set a common vision, share knowledge, and pool resources toward common goals. They then reached out to technical experts, both from within their companies and from external sustainability practitioners, to hone the CocoaAction approach, leverage expertise, and build efficiencies. Through the WCF secretariat, CocoaAction engaged intensively with the governments of Côte d’Ivoire and Ghana, civil society organizations, and other stakeholders to establish agreements on priority issues. During this phase, the companies kept busy internally, aligning already existing individual company programs with CocoaAction’s key objectives. The partnership also established a shared framework of quantitative core metrics and a centralized reporting system to assess its joint progress through aligned measurement based on observational practice. Full implementation of CocoaAction began in earnest in 2016, the same year that the first CocoaAction Annual Report was published, showcasing the progress made to date. Now in its second year, CocoaAction has already achieved major qualitative improvements in the sustainability business practices of its members. Through the partnership, greater understanding and practice about sustainable, inclusive growth and social impact has been documented, not only within individual supply chains but across the sector. The frequency and quality of exchanges between companies and other stakeholders about best practices, data on the state of sustainability of the cocoa commodity chain, and the coherence in design and delivery of sustainability interventions have all improved significantly since the inception of CocoaAction. The partnership has created shared models, systems, and outreach institutions that pursue policy alignment with the strategic vision of the partnership. It also has significantly improved the creation of joint approaches between governments and the private sector; for example, to combat diseases that attack cocoa trees and increase the availability of improved planting materials in West Africa’s extensive cocoa-producing areas. Later this year, the second CocoaAction Annual Report will be published, and it will contain quantitative data that illustrate results achieved thus far at the farmer level, while sharing both success stories and challenges around CocoaAction’s progress in aligning the sector toward inclusive growth and social impact. What’s next for CocoaAction? Going forward, CocoaAction will continue to engage with origin governments, forge new partnerships, learn from the 2016 data and analysis, and look to stakeholders to provide constructive and critical feedback to determine when and where to iterate the strategy. For example, as global market trends evolve, better coordination of national production policies and programs and greater investment in the sector will be essential. Other areas for CocoaAction to prioritize may include promoting income diversification, growing more cocoa on less land, and encouraging greater transparency throughout the supply chain. CocoaAction will continue to engage on these and other emerging topics as the market evolves, to work together toward the vision of a sustainable and thriving cocoa sector. Blue Cross and Blue Shield of Illinois (BCBSIL) has partnered with the Illinois Gastroenterology Group (IGG) to help people living with Crohn’s disease, a lifelong inflammatory disease that typically involves specialty care and hospitalization. Crohn’s disease incurs an average cost of $24,000 for each patient each year, with over 50% of the nonpharmaceutical costs spent on hospital care. Project Sonar is an innovative system that uses SonarMD’s smartphone technology to assist patients in tracking their symptoms and managing their disease. Project Sonar is part of a specialty Intensive Medical Home (IMH), which creates a more comprehensive environment to support patients with chronic diseases. In a review of 23,000 patients with Crohn’s disease, over two-thirds of those who were admitted to the hospital had not seen a doctor within 30 days of the hospital visit. Regular visits to a physician can help a patient with Crohn’s disease avoid hospital visits. To help reduce Crohn’s-related hospitalization rates, Project Sonar tracks symptoms over time and relays that information to each patient’s care team. BCBSIL provided IGG with claims data for its patients living with Crohn’s disease, which revealed a comprehensive view of the patients’ health issues. In addition, BCBSIL conducted an internal analysis to define the SonarMD scoring results and added control data for comparison. The specialty IMH currently coordinates care for 350 Crohn’s disease patients. Project Sonar uses SonarMD to address the health of these patients by communicating with them through a secure web-based platform in lieu of inpatient visits or phone calls. Patients are “touched” at a minimum of once per month with a digital “ping,” which poses a set of questions designed to assess their set of symptoms. Provider efficiency is increased by using technology to engage patients, which allows providers to spend additional time with critical patients who are in need of intervention. SonarMD’s platform was built by physicians who understand the nature of the disease and the needs of the patients, resulting in a tailored approach that impacts the right population. Within the IMH, a nurse care manager approaches each attributed patient to assess his or her medical and psychological needs and to develop an action plan in conjunction with the patient. Patients are then enrolled in the SonarMD platform, where they take monthly symptom assessments and receive reminders and information about their care. The monthly health assessment gathers information about each patient’s symptoms, which is translated into a current symptom score, called a Sonar score. The Sonar score is sent to the patient’s care team, which can intervene before the patient needs to go to the hospital. People with a chronic disease may not recognize when they’re starting to deteriorate, so these touchpoints and monthly surveys help track their symptoms and avoid hospital stays. Project Sonar has been a successful example of population health management, meaning its aim is to increase the health and decrease the costs of a specific population. By targeting the Crohn’s disease population, Project Sonar created significant change that reduced costs and created a better patient environment. This program reduced inpatient admissions and emergency room visits by over 50%. Total cost of care was reduced by 9.8%, even while pharmaceutical prices rose. Members of this IMH saw an improved quality of care and reported improved satisfaction, and patients who responded to their pings drove the half-million dollars in savings. In light of this success, Project Sonar is expanding to include an additional gastroenterology group and may be used for cancer care, diabetes, and other conditions with high complication rates. This partnership is an example of how positive payer and provider partnerships can promote overall member health and well-being while increasing the affordability of care.